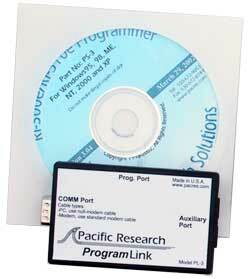 The programming kit includes the ProgramLink, programming cables to connect your controller to your PC. This program runs under Windows 98, XP, NT and 2000. This is a windows based environment that allows you to monitor your controller’s activity, make changes to your controller’s programming, save data files and upload firmware update to the controller without changing any parts.